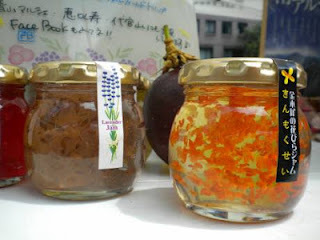 Tasty and beautiful Yamanashi jams at the UNU Market. Like August, September promises a fair bit of heat to Tokyo. The days are slowly shortening, and that means cooler temperatures are on the way. It also means the occasional typhoon will roll through, too, just to keep things interesting. An umbrella for sun or shade might be a good accessory choice this month. Keep in mind, also, that schedules remain a bit wonky due to summer holidays. Read carefully, please! Meanwhile, I'm on vacation again for a couple weeks. Last year it was England, and this year it's China! We'll be exploring Beijing, spending time with friends, and eating ourselves silly. And, of course, I'll be looking for farmers markets. How can I not? *Alert: I'm planning an outing to this market at the end of the month. It promises to be particularly good with a concurrent ceramics market. Send along a comment here with your email (I'll keep it top-secret!) to let me know if you wish to join. More details soon! Update: Usually a twice monthly affair, it has recently switched to once a month. Maybe October I'll organize an outing here to help drum up some action! Update: Note this market, like Ebisu, is only one weekend this month!